Above is an ad for CoinCorner that’s currently up on the Piccadilly Line platform in Green Park tube station. Buying cryptocurrencies is not appropriate for everybody. Cryptocurrencies are not regulated. They are not backed by governments or central banks. Cryptocurrencies are backed by technology and trust. 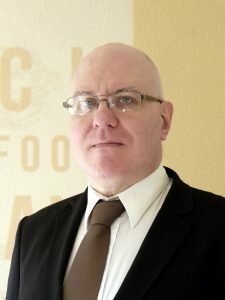 You will not benefit from the protections available to clients receiving regulated investment services, such as access to the Financial Services Compensation Scheme (FSCS) and the Financial Ombudsman Service (FOS) for dispute resolution. You are at risk of losing all your invested capital. The value of cryptocurrencies is variable. When phrases like “a whole new form of money” or “the old rules don’t apply any more” start going around — people get gullible and the ethically-challenged get creative. And one hundred percent of people selling cryptos to retirees are scammers. What attracts people to get-rich-quick schemes? Get-rich-quick schemes work because times are tough, and people are hurting — the economy’s bad, jobs are insecure, costs of living are through the roof — and a lottery ticket chance is the only way out they can see. Particularly when there’s a weird new asset, going through a meteoric price rise, and it’s all over the papers. New paradigm! There’s no way to win following the rules — but this one weird trick is my chance! I can probably trust these guys. People in a tight position start looking at get-rich-quick schemes, and they make bad decisions and lose their money. I’ve had people get really upset at me for being a douse — telling them that unless they’re that good at trading in a scam-filled marketplace … they’ll get skinned. But there’s no such thing as free money. I was never a huge fan of “accredited investor” rules — that you have to have a certain income or level of assets to be able to invest in certain things. It always felt like only the rich were allowed to get richer. My mind was changed when I looked into what happens when those rules don’t exist — the retail investors get skinned. Often in sufficient numbers that it becomes a matter of public concern. There’s a pile of financial instruments that scammers try to sell to the general public — Contracts for Difference, rolling spot forex, financial spread betting, binary options. The key point is that all of these are bets — they’re gambling on a financial outcome. They have their place, and that’s in professional trading — but all of these have been missold to retail investors. Crypto belongs with such instruments. Google and Facebook class it as such, and won’t let you run ads selling cryptos. 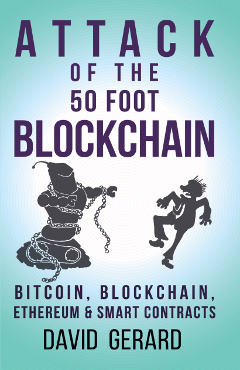 When I started writing Attack of the 50 Foot Blockchain, I just wanted to tell funny stories about dumb crooks. And there’s plenty of those in crypto. Cryptocurrency is a financial instrument that’s stupendously unsuitable for retail investors, and particularly for retirees. Retirees need investments that are sane and stable. But that great big pile of money in a retirement nest egg is a magnet for scammers. Technically, for unethical financial misselling. One hundred percent of these people are crooks. If a crypto salesman shows up to your retiree group, they need to be tarred and feathered, and run out of town on a rail. 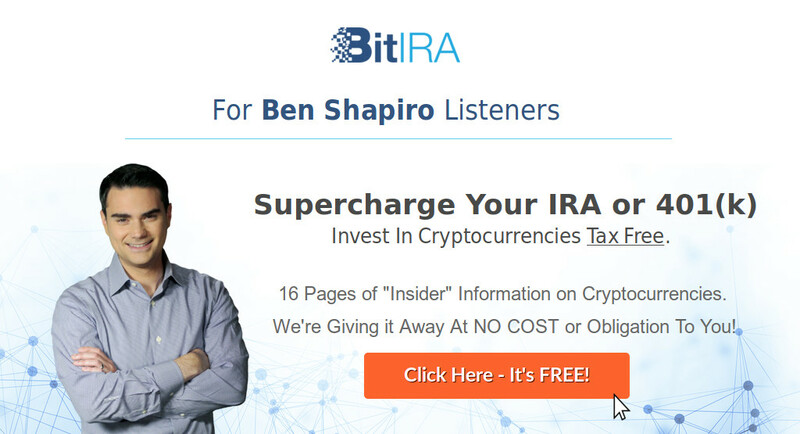 The other pitch to retirees is using a trusted media face — conservative radio host Ben Shapiro has been pushing Bitcoin IRAs (archive) of late, through his Ben Shapiro Gold Company. We probably can’t stop people buying cryptos if they want to. By all means, buy five quid of ether and watch it go up and down — it’s very closely and personally educational! Particularly when the number goes down. Crypto advertising to the general public needs to be banned. Anyone running an ad on the Tube for cryptos is a crook. This stuff isn’t even as regulated as gambling ads. You can make money from cryptos! But it is vastly more likely that you will be the one that the first guys make their money from. This is a zero-sum shark pool. Are you quite sure you’re that good? Remember: if it sounds too good to be true — it is. Photo courtesy an anonymous reader. Thank you! 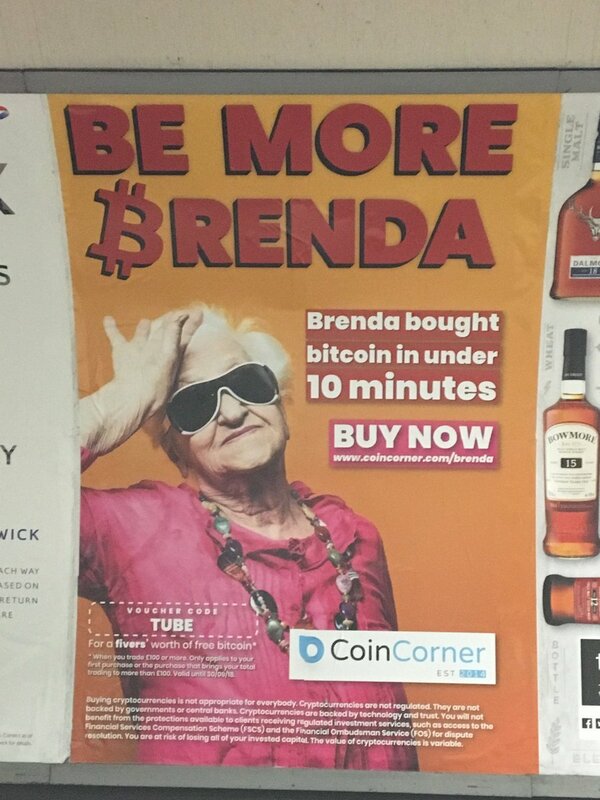 Given the dodgy relationship to the UK regulations authorities – i.e., marketing Bitcoin like that is probably against the regulations for a British company – I wonder how it can even be legal to publish an ad like that in the tube. The company behind may be safe on the Isle of Man, but someone in the chain of events which led to the ad going up might have committed an offence. I mean, imagine if it were a pyramid game or a Nigerian 419 scam. _Someone_ along the way would have committed something punishable. IANAL, i hasten to add. This is why ASA complaints may be a starter for this ad in particular, and the FCA for advertising cryptos to the public in general. I have been listening to Ben Shapiro everyday for more than a year now, and I have never heard him shill BitIRA. He does multiple sponsor advertisements every podcast, so there are plenty of opportunities to shill BitIRA. Upon further research, it seems like BitIRA is a part of Birch Gold. Ben Shapiro does not own Birch Gold, nor does he have any stake in it, thought he is heavily sponsored by Birth Gold. “Ben shapiro gold company” doesn’t mean its his company, its just a easy link for people to get referrals. BitIRA does show up on DailyWire (shapiro’s company)’s sponsorlist, but that seems to be an addon from Birch Gold. Birch Gold is a fairly trusted gold company. Even though I because that crypto is deeply flawed and has a limited future, I don’t see that as some obvious truth that every believes, therefore everyone dealing in the space is a scammer. BitIRA is probably a legitimate business backed by a flawed concept. I’m pretty confident that BitIRA is less than on the level, given their persistent emailing behaviour … they’re still at it. I think Ben Shapiro needs to pay more attention to what he’s lending his name to – my main point is that getting a celebrity face is unfortunately common as a scammer strategy. I appreciate that slipups can happen, but perhaps as a fan you need to get in touch. I wouldn’t judge a company based on their persistent emailing behavior. Every company I ordered stuff from sends daily advertisements. This is even more true for companies that work on a commission based system. Because of this, I have a separate email I use when I was buying a car, when I was trying out gyms, and when I was looking for apartments. Recently, I bought a Dell laptop and I’ve been getting calls trying to sell me extended warranty. The truth is that giving out your contact to salesmen will get you put on the list of leads for salesmen. I agree that celebrities should control their personal image, and the good ones work with their sponsors when there is a mixup with their fans. What I am trying to say is that, while it is apparent to you or me that cryptocurrency has many problems, it is entirely possible to perform due diligence and come out with a conclusion that cryptocurrency is viable to be a part of your portfolio. It comes down to how you choose to view the situation. Its easy to think that your views are the absolute truth when you surround yourself with a likeminded community, but its possible the other side could see a legitimate business opportunity rather be acting out of some nefarious ill will. I find myself utterly unconvinced that any of this is a good idea, or a reputable one to promote. You’re bending over backwards to make excuses for reprehensible scammers.